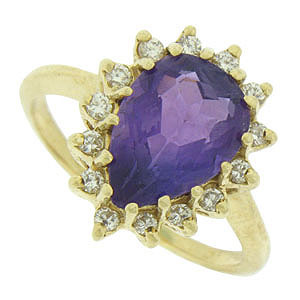 A breathtaking tear shaped amethyst is set in the face of this elegant estate ring. 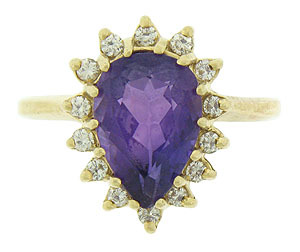 Fourteen round cut diamonds surround the handsome center stone. 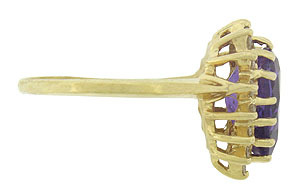 A double row of elongated prongs gives abstract organic detail to the elevated crown. 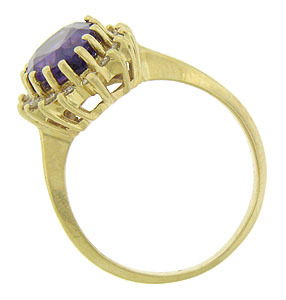 The exceptional ring is fashioned of 14K yellow gold and measures 16.40 mm in width. Circa: 1950. Size 8 1/4. We can re-size.